Warranty: GoPro products and accessories are guaranteed against manufacturing defects one (1) year from the original date of purchase. GoPro's sole obligation in the event of such defects during this period is to repair or replace the defective part or product with a comparable part or product at GoPro's sole discretion. Except for such repair or replacement, the sale, processing or other handling of this product is without warranty, condition or other liability even though the defect or loss is caused by negligence or other fault. Damage resulting from use, accident, or normal wear and tear is not covered by this or any warranty. GoPro assumes no liability for any accident, injury, death, loss, or other claim related to or resulting from the use of this product. In no event shall GoPro be liable for incidental or consequential damages relating to or resulting from the use of this product or any of its parts. Because of possible user resealing error, this product is not warrantied against waterhousing leakage or any resulting damage. Please review and follow the instructions carefully when sealing the waterhousings! Returns or replacements of parts and/or products may be subject to shipping, handling, replacement and/or restocking fees. 1. It can mount monitor and LED Lights on the one end via 1/4'' screw. 2. It can lock the rod on the cage via the clamp tightened by the locking knob. 3. It could be attached and detached from the monitor quickly and the position of the monitor is adjustable. 4. The rod clamp fits DJI Ronin & FREEFLY MOVI Pro & all 30mm rods and can also be adjusted with ease. 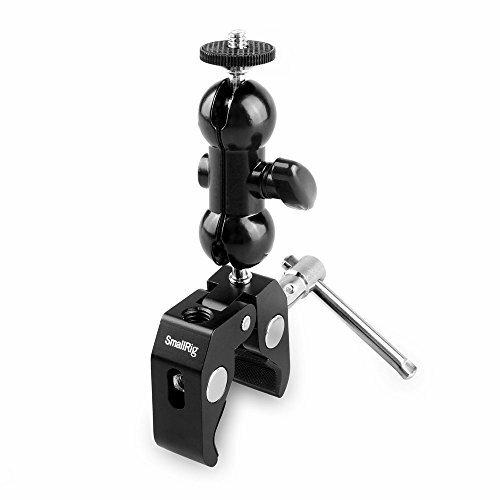 SmallRig Multi-function Double Ballhead 1138 is a multifunctional double ball head with a clamp at the bottom and a 1/4" screw on the top. It can mount monitor and LED Lights on the one end via 1/4'' screw, and it can lock the rod on the cage via the clamp tightened by the locking knob. It could be attached and detached from the monitor quickly and the position of the monitor is adjustable as per your needs during shooting. The rod clamp fits DJI Ronin & FREEFLY MOVI Pro & all 30mm rods and can also be adjusted with ease. Compatible cameras include (but not limited to): GoPro (HERO HD/2/3/3+/4/5/6/7/(2018), HERO Session and HERO 4/5 Session), Sony Action Cam (HDR-AS300, FDR-X3000, HDR-AS50, FDR-X1000V, HDR-AS200V, HDR-AZ1, HDR-AS20, HDR-AS100V), 360fly (360fly 4K, 360fly HD), Contour (ROAM3, Contour+2, ROAM2, Contour+, ROAM), Drift Innovation (Ghost 4K, Stealth 2, Drift HD, HD Ghost, Drift HD720, HD170 Stealth, HD170, X170), Garmin (VIRB Ultra 30, VIRB X, VIRB XE, VIRB Elite, VIRB), ISAW (Edge, Edge Lite, Wing, Air, Extreme, Advance), JVC (Adixxion GC-XA2, Adixxion GC-XA1BUS), Kodak (PixPro Orbit360 4K VR , PixPro SP360 4K VR , PixPro SP360, PixPro SPZ1, PixPro SP1), Nikon (KeyMission 170, KeyMission 360), Olfi One.five, Olympus (TG-4, TG-Tracker, TG-870, TG-860), Panasonic (HX-A1), Ricoh (WG-M2, WG-M1), Rollei (Actioncam 430/425/415), SJCam (SJ7 Star, SJ6 Legend, M, SJ5000, SJ4000), TomTom Bandit, Veho (Muvi K-Series K-2 Pro 4k, Muvi K-Series K-2, Muvi K-Series K-1), Yi Technology (4K+, 4K, Yi Action Camera). Please store in a dry and cool place and keep away from fire and flames. Warranty: 90 days money back and return policy. Should you get any quality problem please do not hesitate to contact with our online customer service for help! Great Compatibility Compatible with action cameras GoPro, Sony Action Cam, 360fly, Contour, Drift Innovation, Garmin, ISAW, JVC, Kodak, Nikon, Olfi, Olympus, Panasonic, Ricoh, Rollei, SJCam, TomTom, Veho, Yi Technology. Also works with point-and-shoot cameras and handheld camcorders that have a universal 1/4-20 tripod socket. Perfect Outdoor Shooting Accessories Perfect for hiking, skiing, mountain clamping, biking or other outdoor sport activities where you want to take videos from a lower than the helmet view. Comfortable and Stable TELESIN Shoulder Strap Backpack Mount is made of elastic nylon and polycarbonate buckle, very soft and comfortable to wear. It adopts ergonomic design, and weight is distributed evenly by way of shoulder pad. Security Assurance Base plate made of shock-absorbing elastomer fits comfortably and reduces camera shake for higher quality camera video. Adjustable shoulder pad fits with different sizes of shoulder straps to provide more usage possibility. Package Content and Warranty Package includes 1pc Backpack Strap Mount + 1pc J-Hook. The Camera, Frame Case, Screws and all other accessories in the pictures are not included! 90 days money back and return warranty! Should you get any quality problem please do not hesitate to contact with our online customer service for help! Take your camera out of CapturePRO and put it directly into most ARCA-type tripods with the included Standard Plate quick-release plate. Works with straps up to 3 inches (7.6 cm) wide and 0.5 inches (1.3 cm) thick. Attach the clip anywhere on your belt, backpack strap, backpack waist strap, messenger bag strap and more. Your camera will always be in reach. Holds your camera rigidly. Unlike other camera carrying solutions, CapturePRO holds your camera completely rigidly, making it ideal for more intense activities like hiking, biking, skiing, snowboarding and climbing. Capture boasts a weatherproof aluminum clip especially rugged environments. Mount your GoPro to handlebars, seat posts, ski poles and more. The hinged design easily clamps to different mounting locations. The mounting base rotates 360 Degree to give you different camera angles at the push of a button and lets you move between mounts quickly. Fits 0.35 to 1.4in (9 to 35mm) diameter tubes. - GoPro Hero4, Hero3+ Black edition, silver, white, Hero3, Hero2, and HD Hero original cameras etc. adhesive mounts that are easily attached to flat and curved surfaces for use during any action sports. attach your GoPro to any helmet, kayak, car hood, Surf board - only imagination is your limit! a "must have" For biking, skiing, climbing, motocross, water sports, kayaking, mountain biking, Surfing etc. pads are removable from surface by applying heat (E.G. Hair dryer). we are so confident in our Nordic Flash GoPro accessories that we offer a 1 year manufacturer's warranty. click the add to Cart button at the top of this page now and capture awesome videos with your GoPro camera! One year warranty for every purchase from AxPower, 30 days money back. [BRAND]AxPower USPTO #87179756 is a registered trademark protected by US Trademark Law. AxPower products are sold by authorized sellers only. AxPower's focus is on providing both wholesale and retail of products, it has been selling products to most countries in Asia, North America and Europe, and enjoys good reputation. [Feature] Industrial strength waterproof adhesive mounts which can attaches on almost any sureface, also easily be removed. 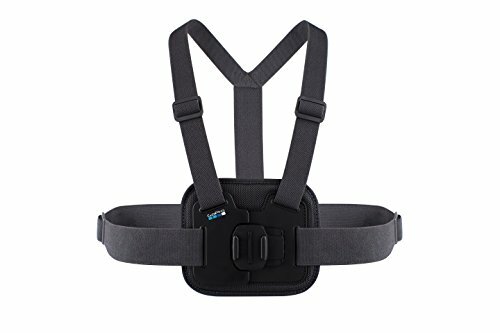 [Suitable] Perfect for skiing, mountain biking, motocross, water sports, climbing and other action sports. 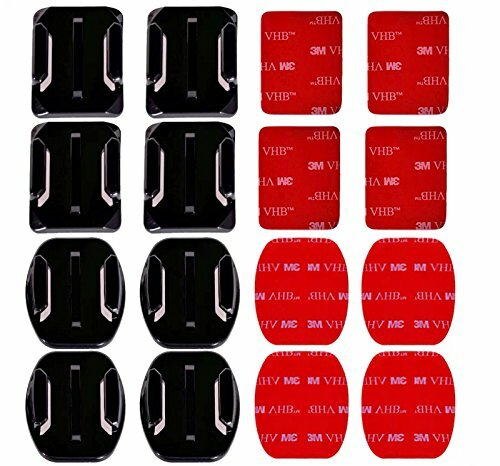 [Include] 4 x Flat Surface Mount, 4 x Curved Surface Mount, 8 x 3M Adhesive. 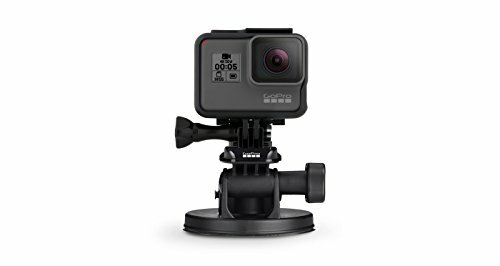 [Compatible] All GoPro Cameras HERO5, HERO4, HERO3+, HERO3, HERO2, HD HERO & SJ4000 etc. Made of high quality plastics: PC+ABS plastics. Updated structure design, more sturdy and tighter. Perfect for clipping on backpack strap to capture images directly in front, easy to install and remove. 360 degree rotation the direction and stand angle adjustable to your needs. It's for use during non-impact activities only: walking, hiking, outing etc. Suitable for walking, hiking, outing and other non-impact activities only. 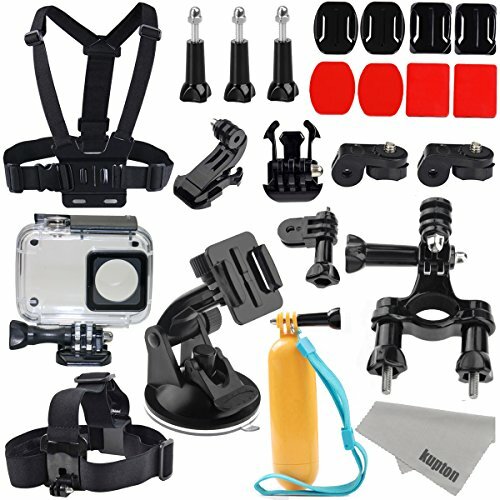 Go Pro Hero6, Hero5, Session, Hero4, Hero3+, Hero3, Hero2, Hero1 and most action cameras. 12 months worry-free product guarantee from Sametop. Upgraded structure design and high quality plastics, more sturdy and tighter. Perfect for clipping on backpack strap to capture images directly in front. 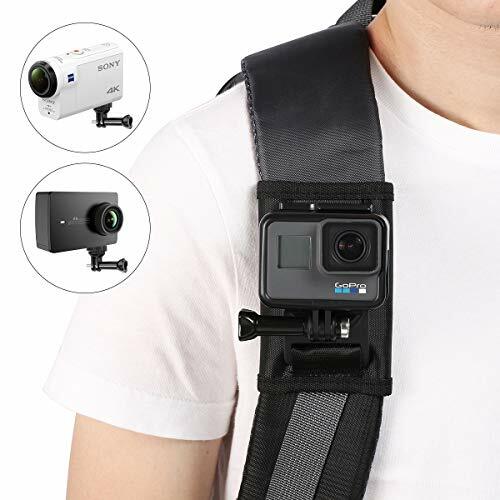 Compatible with: Go Pro Hero (2018), Fusion, Hero7, Hero6, Hero5, Hero4, Session, Hero3+, Hero3, Hero2, Hero1 and most action cameras. 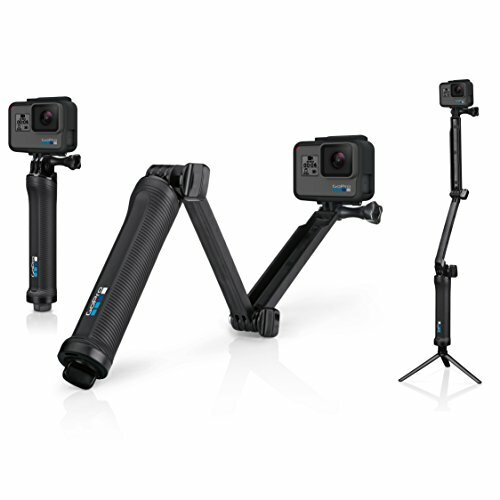 The Osmo Pocket Tripod Mount has dual 20 mounts enabling you to attach your favorite tripod or microphone to increase the production value on your next shoot. 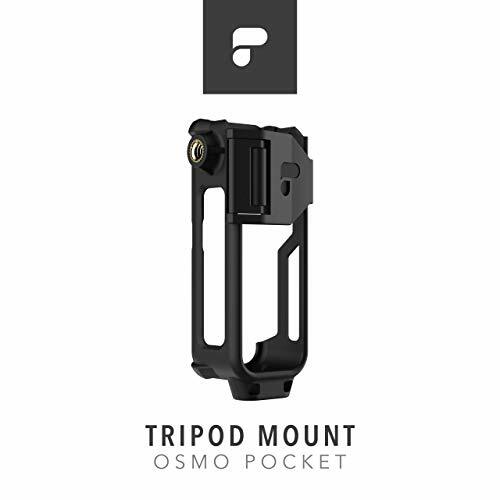 Compatible with both the Control Wheel and your mobile phone, the tripod mount doesn't hold your Osmo Pocket back. 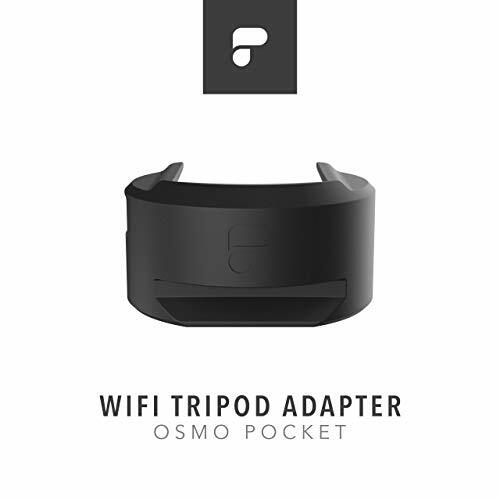 Designed to make the Osmo Pocket Wifi Base tripod compatible enabling you to control your system remotely. The Arca-Swiss quick release system gives the ability to slide into a tripod plate without having to worry about setup time or breakdown, while the 20 thread presents added versatility and mounting options during a shoot. Don't worry that we already do the test for this holder, which could correspond most of action camera and knapsack. We promise to provide the best quality & service to customers,please do not hesitate to contact us if have any question about the products. The package is not include the action camera & case. &star; The backpack fixed mount support to rotate 360 degree, the largest width of backpack should be 3.5 inches and the least width should be 2.5 inches. &star; Easy and quick to install on your knapsack with your sport camera, which use of Hook&Loop. &star; Skid resistance material on interior that appress with your backpack. &star; You could using on climbing, walking, traveling, cycling, expedition etc. 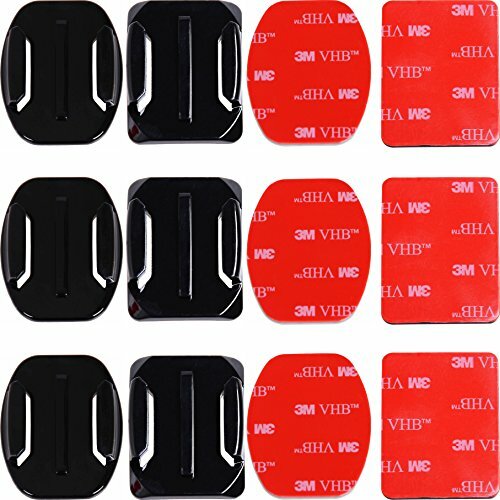 &star; Compatible with GoPro Hero / Session / Funsion / Mount of action camera. This slim, lightweight housing can be used as a spare or replacement for HERO3 or HERO3+ cameras. The flat glass lens delivers maximum image sharpness above and below water. Large buttons make it easy to control the camera -even while wearing gloves or mittens. Waterproof to 131'/40m. Includes Standard + Skeleton Backdoors. Hello, this is the kit for Xiaomi Yi 4K/II action camera/Yi Lite that many of you hava been looking forward to, here it is. As a basic starter accessories kit for Yi 4K camera, it covers your most needs when you are doing outdoor sports. 3. Ideal for diving, snorkeling, surfing, wakeboarding and other water sport activities. Note: accessories Only, cameras not included. As a basic starter accessories kit for Yi II/ 4K action camera/Yi Lite, it covers your most your needs when you are doing outdoor sports. 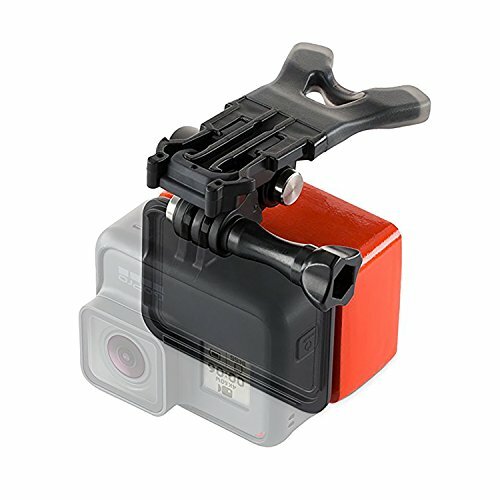 Waterproof Housing case: Specially designed for Yi 4K action camera/Yi Lite, made of high transparent material to ensure the clear photo shooting, submersible up to 131 feet/ 40m under water, ideal for diving, snorkeling, surfing, wakeboarding and other water sport activities. With this case you can connect your YI action cam to other accessories ONLY using a screw. 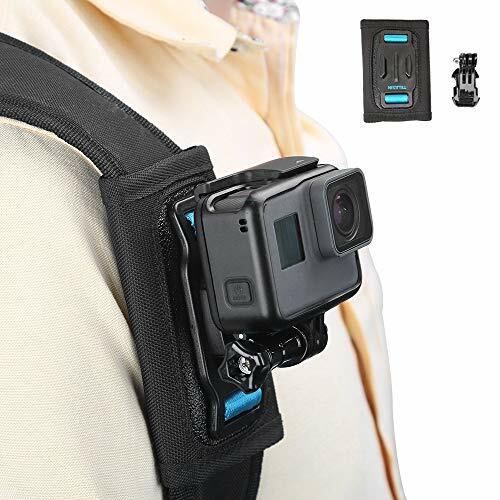 Chest harness mount allows you to use your camera on chest to record those before you. It's fully adjustable to fit a wide range of adult sizes. Head strap mount makes it easy to capture immersive video and photo footage from your head; can be used on head or helmet, not recommended for high-impact activities. Floating handle grip is designed to keep your camera with a waterproof shell easy to float on the water. Bright yellow makes it easy to spot if you drop it. The double protection design of adjustable wrist strap ensures the safety of your action camera while using it. Suction cup + buckle: attaching your camera securely to cars, dashboard or roof, boats, motorcycles and more industrial Strength. This is an essential gadget for anyone watching or photographing subjects from their vehicle. Includes a Head Strap and a Quick Clip for a variety of head- mounting options. 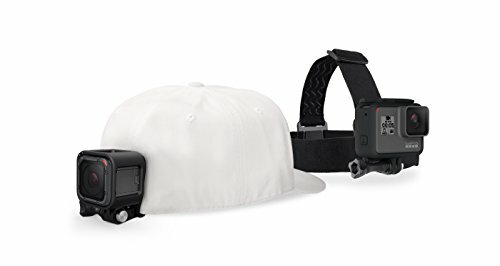 Fully adjustable to fit all sizes, the Head Strap can be worn over a helmet or directly on your head to capture footage from a headlamp-like perspective. 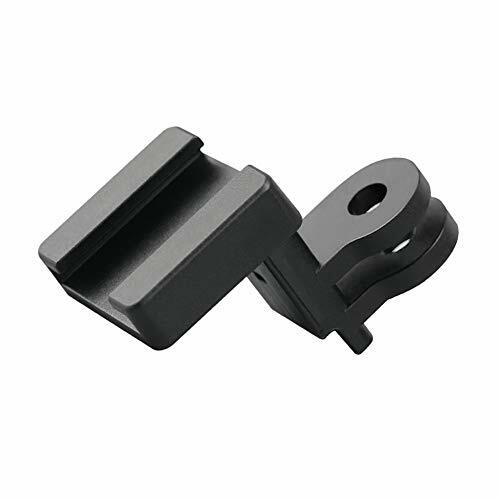 The Quick Clip enables ultra-compact, low-profile mounting, and can be used to attach your GoPro to a backwards baseball cap or other 3mm to 10mm thick object. The padded, flexible chesty makes it easy to capture immersive hands-free shots from your chest. Made from breathable, lightweight materials, it can easily be adjusted to comfortably fit a wide range of body types. It s perfect for biking, hiking, skiing or any adventure where you want amazing POV footage. FORM AND FUNCTION - The mount is made from stainless steel and covered with a smooth layer of silicone which makes it very durable. The easy to install mechanism allows you to move the camera from one place to another without any hassle. 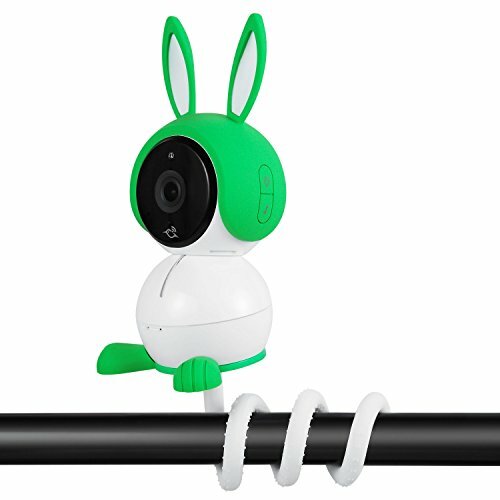 VERSATILE MOUNTING OPTION FOR ARLO BABY CAMERA - The Twist mount is very versatile as it can be wrapped around anything. The flexible mount can easily be attached to the pram, cradle, doorknob or anywhere you like and it also allows 360-degree rotation and can be bent into any angle you need. NO TOOLS OR WALL DAMAGE - the flexible silicone arm can be seamlessly attached anywhere your heart desires and all of this without laboriously drilling holes or troublesome screws. The mount can be wrapped around anything and it will hold its shape. WASSERSTEIN SAVINGS FOR ARLO ACCESSORIES - Realize huge savings when you buy two or more of our Arlo Accessories - Use discount code ' ARLODEAL' at the checkout. Other Arlo Accessories include Suction Cup Mount for Arlo Baby(ASIN: B07DN71TYV), Arlo Pro and Pro 2 Metal Wall Mounts (ASIN: B06WVC78KS, B06X6H8QDY, B073XLQXTY), Arlo Pro and Pro 2 Magnetic Mounts (ASIN: B01DVO1PD2, B071YF3PZJ) and Arlo Pro and Pro 2 Silicone Skins (ASIN: B07CYZ3DQM, B06XSW2T5Z). PACKAGE CONTENTS: 1 x Twist Mounts for Arlo Baby Camera. As well as the Wasserstein Warranty - If you should be unsatisfied with our products, please get in touch with us, and we will try to resolve the issue. Professional Designed: Compatible with Wyze Cam Pan Security Camera ONLY. 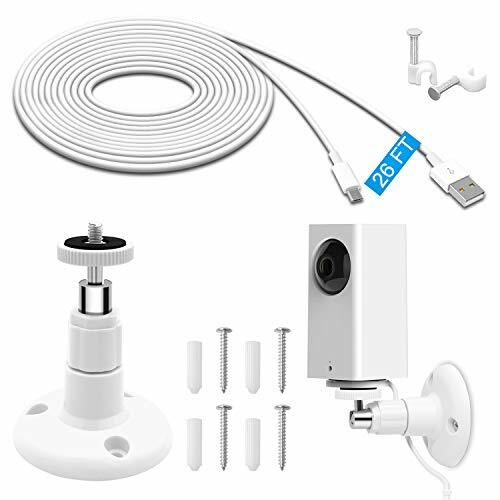 Package include Camera Wall Mount + 26 FT Charging Cable + 30 Wire Clips + 4 Screws + 4 Wall Plugs. Charging Cable: USB to micro USB 26FT Extension power cable keeps your indoor or outdoor Wireless Security Camera connected over a much greater distance. Works as power and data cable, fast Charge-A maximum charging speed up to 2A. Stable data transmission and fast charging. Wall Mount: Made of high quality ABS plastic and aluminum material, it can protect the security camera work stably. Provide 360 rotating angle and 90 tilt ensure your camera monitor in an all-round way without blind spot left and can adjust it whatever angle you like. Easy to Install: Comes with screws and wall plugs, easy for you to mount the camera and the cable. Please adjust your angle before you mount so you know where to mark the installation screws. These tools make the walls look cleaner. Guaranteed Quality: If you are not 100% happy with Wyze Cam Pan Mounting Kit, please feel free and contact us. MENEEA provide 12-Month Worry-Free Warranty and Unconditional 45-Day Refund & Free Lifetime Technical Support. This versatile Bite mount with an easy-to-spot float is ideal for hands-free POV footage and more. Capture smooth, stabilized video while comfortably holding the camera with your mouth. 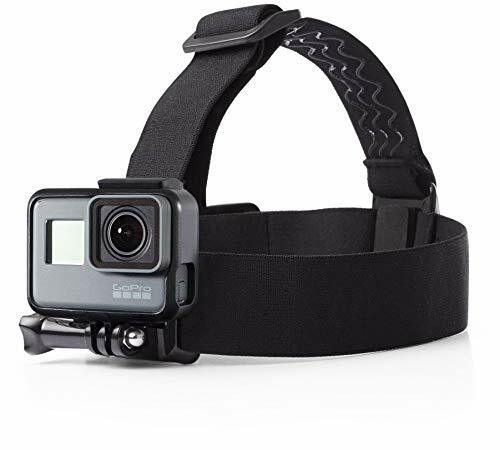 Plus, the built-in mounting buckle slides into any compatible GoPro mount, making it easy to capture multiple camera angles and Dynamic changes in perspective. 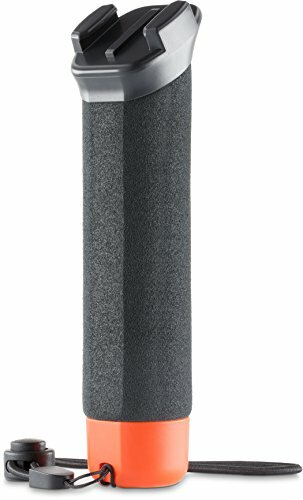 VERSATILE - Features tripod screw (1/4-20) to connect a variety of cameras to GoPro mounts, including mirrorless, micro 4/3, point and shoot, action cameras and many more. SECURE - Ergonomic thumb screw and rubber base, guarantees a snug fit to your camera or other device. COMPATIBLE - This adapter will work on any device which connects to a GoPro style 2 prong to 3 prong mount. This is not limited to any particular brand. CNC MACHINED - All aluminum CNC machining for years of problem free use. 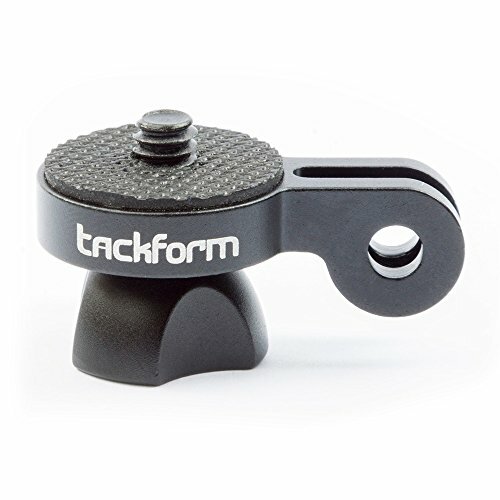 100% Lifetime Warranty - Tackform is a family-owned, American company. We stand behind each of our products with a 100% Warranty. 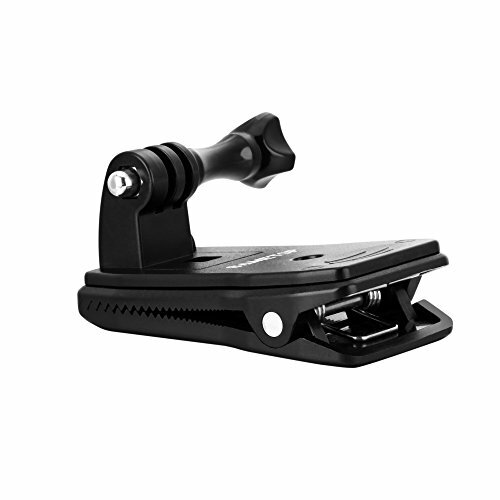 The PGYTECH OSMO Pocket Data Port to Cold Shoe and Universal Mount extend the possibilities to connect additional accessories such as photography lights, microphones, the PGYTECH tripod, and the backpack strap to the OSMO Pocket through a cold shoe and a universal mount. 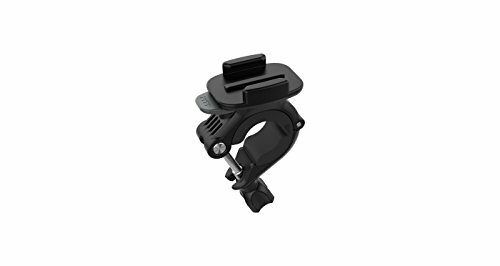 Optionally, two connectors can be secured together to enrich the usage possibilities and functions of the OSMO Pocket. 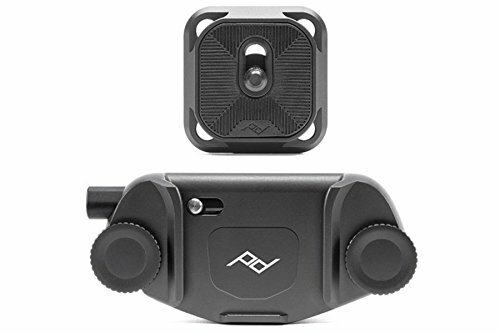 The PGYTECH OSMO Pocket Data Port to Cold Shoe and Universal Mount extend the possibilities to connect additional accessories such as photography lights, microphones, the PGYTECH tripod, and the backpack strap to the OSMO Pocket through a cold shoe and a universal mount. 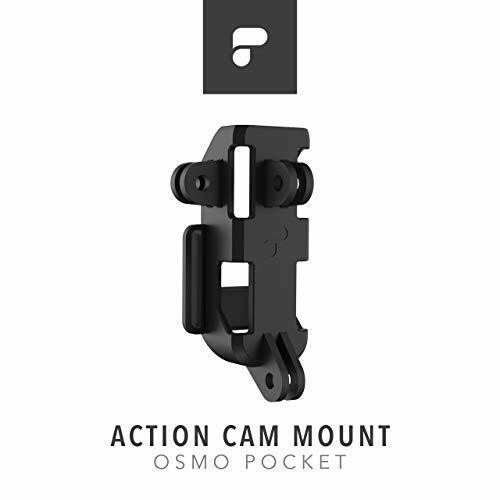 Two connectors can be secured together to enrich the usage possibilities and functions of the OSMO Pocket. The USB-C cable cannot be utilized together. Please carefully read the instructions before using.